Note – Flag referred in all the queries is a sample table created by me. Now lets say we want Row Numbers with out this ORDER BY Column Clause. We can use below methods to get row numbers without ORDER by Column. %%physloc%% is a Virtual Column. This column is undocumented. Hence you can use it at you own risk.The %%physloc%% virtual column returns a record locator value similar to the one you can find in the different lock related trace events. Actually each table has a “hidden” column called %%physloc%% which stores a row’s physical location in hexidecimal form. That’s pretty hard to understand. 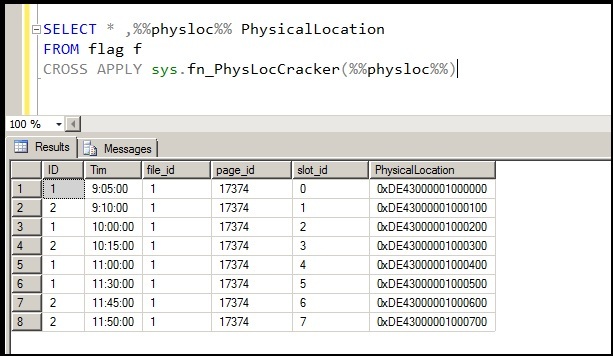 SQL Server offers a way for us to read this information a little more easily: the sys.fn_PhysLocFormatter function, which is present on sqlskills.com. According to Paul Randal of sqlskills.com – It gives the database file, page within the file, and slot number on the page in the format (file:page:slot).